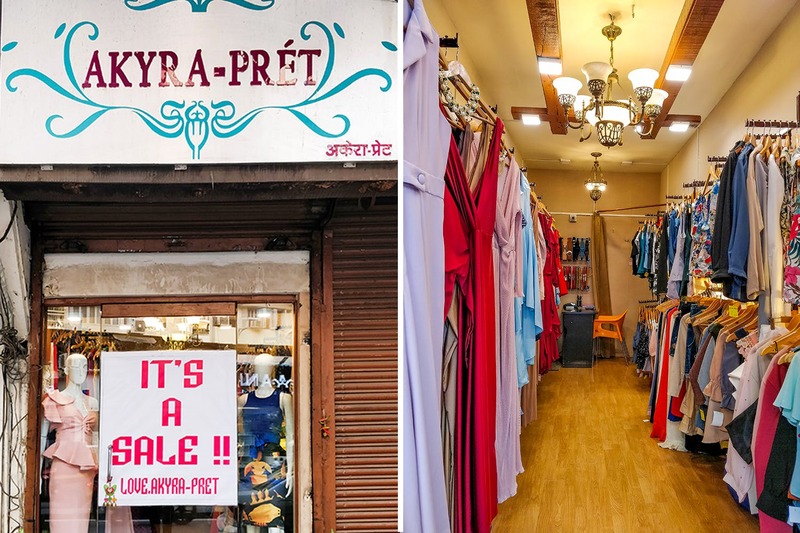 On one side of the Lokhandwala complex when the density of the shops gets scanty, you will spot a pink board that reads Akyra-Pret. A lane-y store, it has only clothes hanging on either side. Bright colours, interesting textures and prints, everything that this designer store sells is under INR 5,000 at any given point. Interesting, right? Once you start scouring through the dresses you will realise the uncanny resemblance they have to the ones worn by your favourite TV and B-Town celebrities. And that’s because many production houses source their costumes from Akyra-Pret. At any given point, everything in this store is under INR 5,000. Having said that the full-length dresses start at INR 2,350 and are available in all sort of cuts and designs – a deep neck, a high slit, embellished and with frills. They also have an exciting range of jumpsuits, the kinds that will keep you comfortable in a formal function starting at INR 2,850. If one-piece attires are not your jam, you can also pick from their quirky range of tops, shrugs and jackets. Overall, this is the place to score your outfit for a fancy evening, where Akyra-Pret will assist you to slay it through and through. Get your diva mode on with gowns, maxis, jumpsuits and more that will instantly raise your glam quotient. Also, you could be twinning with a celeb.